Setting up iSquare ezyCheque Standard Edition 3 is very easy. When you open iSquare ezyCheque Standard Edition 3 for the first time, you will be prompted with a Getting Started Wizard screen. This Getting Started Wizard will collect your license key information, company contact information, and your user log-in information. License Key Information - License key will be provided to you when you purchase the full version. Company Contact Information - This company contact information is important for us to contact you. User Log-In Information - You will be required to input your username and password to be verified every time you open iSquare ezyCheque Standard Edition 3. After you have setup ezyCheque at the Getting Started Wizard, click on the Add Co. button to add new company at the Company Selection screen. New Company Type - select New Company with Clean Data. Company Information - the new company information. Company Logo - the company logo to be shown in Payment Voucher. Settings for Running Number - running number format for Payment Voucher. Database Master Password - password to protect the company database. After you have fill up all the information, click Finish to create the company. Double click the company you just created in the Company Selection screen to open. You will need to create a bank record in order to start writing a cheque. Click on Banks Setup button on the main screen to open up the Banks Setup screen and click Add button to create a new bank. You will be prompted with a Bank Setup Wizard screen. Please follow the steps below completely to understand how ezyCheque works for cheque's alignment setup. You can go to the user guide for advance details. Key in the Bank Name, Bank Code, Account Number, Branch (the branch of the bank), and Current Cheque #. Current Cheque # will be used and saved in the Payment Voucher. Select the Printer Name and Paper Source to be used to print the cheque and click Next >. Select the Paper Source only if your printer has a separate paper tray for the cheques. Else leave it empty. Select the Template radio button and the available template listed. For example, if you are adding a Malayan Banking Berhad's cheque, select Malayan Banking Berhad.ebf. Click Next > to continue. If your bank are not listed and you are adding a Malaysian bank's cheque, select Manual Adjustment radio button and click Next >. For other countries bank's cheque, you might need to adjust the date type and cheque size. If you are adding a Malaysian cheque either with a Template, or Manual Adjustment, click Next > again to skip this Adjust Cheque's Fields Location page. The fields are all adjusted accordingly for Malaysian cheque and you do not need to adjust anything. If you are adding other countries bank's cheque, please follow the advance steps in user guide to adjust the fields. You will come to the Adjust Cheque's Printing Location page. Select the printing Orientation and adjust the cheque location in Quick Align buttons base on your printer type and cick Next >. This page is important to make sure the cheque is printed correctly. You might need to test print several times to make this setting correct. 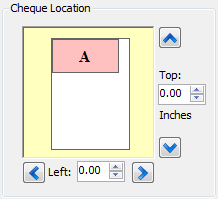 The steps for this setting has been created in a separate section here - Adjust Cheque's Printing Location. Please go to the section to fully understand and follow the steps before continue the following steps. Select your preferred amount in word's language and security style and click Next >. Click Finish to complete the wizard. You will need to wait for a few second for ezyCheque to complete this task. Cheque's Printing Location adjustment is the key step to make sure the cheque is printed correctly. Below is a quick guide adjustment for each printers. Please follow the following instruction to set correctly. Set the Orientation to Portrait , and click on the Middle-Left button in the Quick Align section. Insert a void / cancelled cheque in the center of the laser printer's secondary tray (or primary tray if your laser printer just has one standard tray). If you do not have a void or cancelled cheque, you can print a mock cheque by clicking on the Print Mock Cheque button. You will need to cut the mock cheques out from the A4 paper and place it in the printer's tray. Click Print Sample button to test print and check whether all the labels are printed in the correct alignment. If the labels are printed upside down, insert the same cheque but in reverse direction. Click Print Sample to test print again. Else, go to the next step. 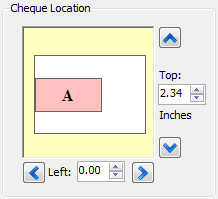 If the labels can't be seen or printed far away in the cheque, adjust the location of the cheque by clicking on the Middle-Right button in the Quick Align. Else, go to the next step. If the labels are now mostly visible printed on the cheque, but the whole alignment is out, let's say a little away to the left, adjust the Left value in Cheque Location, adding the value in CM or inches. 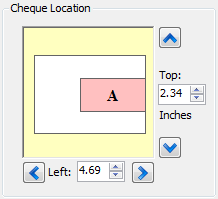 If it is a little away vertically to the top, adjust the Top value in Cheque Location, adding the value in CM or inches. Insert the void / cancelled / mock cheque in the printer's tray and Print Sample again. Repeat step 6 and step 7 until all the labels are printed correctly. Click Next > and Finish button to save the setting. Set the Orientation to Portrait , and click on the Bottom-Left button in the Quick Align section. Insert a void / cancelled cheque to the side of the inkjet printer's tray. If the labels are now mostly visible printed on the cheque, but the whole alignment is out, let's say a little away to the right, adjust the Left value in Cheque Location, subtracting the value in CM or inches. If it is a little away vertically to the bottom, adjust the Top value in Cheque Location, subtracting the value in CM or inches. Insert the void / cancelled / mock cheque in the printer's tray and Print Sample again. Repeat step 5 and step 6 until all the labels are printed correctly. Or set the Orientation to Landscape , and click on the Top-Left button in the Quick Align section. Insert a void / cancelled cheque to the zero (0) mark of the dot-matrix printer's tray, upside-down (cheque face facing down). Place the cheque base on the Orientation you set at step 1. If the labels are now mostly visible printed on the cheque, but the whole alignment is out, let's say a little away to the right, adjust the Left value in Cheque Location, subtracting the value in CM or inches. 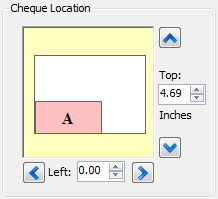 If it is a little away vertically to the top, adjust the Top value in Cheque Location, adding the value in CM or inches. Writing a cheque with iSquare ezyCheque Standard Edition 3 is very fast and easy. You will be able to write and save cheque record at the Company Main screen - right afer you select the company. Key in the cheque date, payee's name, and cheque amount in the Cheque section. Key in the invoice number, invoice date, payment description, and invoice amount in the Payment Voucher section. The total of line items amount in Payment Voucher should equal to the cheque amount. You can quickly copy the cheque amount to the Payment Voucher line item by clicking on the Copy Amount button. Click Write to preview the cheque. Insert the cheque bearing the cheque number shown in the Print Preview screen in the printer's tray and click Print. The payee's name, cheque's detail, and payment voucher will be saved automatically after you print the cheque. At the Company Main screen, click on PV Records button or menu Bank → PV Records to open Payment Voucher Records screen. Select the record that you wish to print the payment voucher at the Payment Voucher Records sceen and click Print PV button. Select more than one records in Payment Voucher Records screen to print them in bulk. Payee's details such as address, phone number, fax number and email address will be shown in payment voucher. The details will be an aid for payment voucher issuer to contact the payee. click on the Payees List button or menu Tools → Payees List at the Company Main screen to open Payees List screen. Click Add button to add new payee details, or Edit to edit the selected record.